Synergy 2.0 worked for me for about 10 minutes after I initially installed it (I joined the party at Beta 4). Ever since then I have been getting a message saying "There was a problem connecting to the background service. Retry". Retry of course does nothing. I have tried every beta and RC up to current (RC2) thinking that at some point this issue must be fixed. It hasn't. I have tried the troubleshooting steps and I am fully removing the software before installing the new versions. In the same boat, never works in the beta not works in RC2 I don't know if there is a developer fault or ours to still waiting for this software works like before. I'm having the same issue on MacBook Air running El Capitan. It was working perfectly on RC1, worked for a bit on RC2, now there is a problem connecting to the auto-config service. I retry, this then works and then there is a problem connecting to the background service. I too, am experiencing this issue with RC2. After I finally got it to log into Symless for my Windows 10 and Ubuntu 16.4, I'm now receiving a message "There was a problem connecting to the background service. Retry". I'm seeing this message on both machines. Same problem, both windows 10 PC and os x machine. Same boat. No dice on connecting to the service, it keeps looping back to "retrying websocket connection". I'm not sure who thought it was a bright idea to link a piece of productivity software to an always on drm scheme but it's a runner up for poorest implementation of anything for the current decade. I think my issue is related to this, trying to "sign in with symless" occasionally results in a 504 gateway error, or it says session already established but the client still says "sign in with symless". I also can't connect to the config service. I'm wondering if their server is just down. Can ANYONE connect to it at this point? I'm not sure all these replies are really the same issues, but I don't doubt the are all generally related in some way. Specifically, my issue is that the Synergy service does does not run and there is no way I can find to make it run. The instructions posted in the manually restarting services thread below only work if the service is already running. Mine's still super broken. Now I can't even attempt to log in. If I click the "sign in" button, nothing happens. I can't even open the debug panel. "[ Config  ] [2017-11-07T17:01:03] ERROR: Reply status code: 503"
"[ Config  ] [2017-11-07T17:01:03] ERROR: failed to check update: reply has error: Error transferring https://v1.api.cloud.symless.com/update - server replied: Service Unavailable"
My Mac client suddenly started working. I have no explanation as no changes have been made on my end. Mouse and keyboard sharing worked successfully for a few minutes between my mac and Windows 10 client, but now my Windows 10 machine won't connect! Win10 prompts me to sign in with Symless. When I try it says Login failed. Session already established. This is CRAZY! The software hasn't yet worked for me for more than a few minutes. Any guide to uninstall the application and delete the preferences files, I want start since zero but I don't know how made this. So far things are now working for me on mac and windows since fully uninstalling and installing Synergy 2.0 Stable. Time will tell if it keeps working. 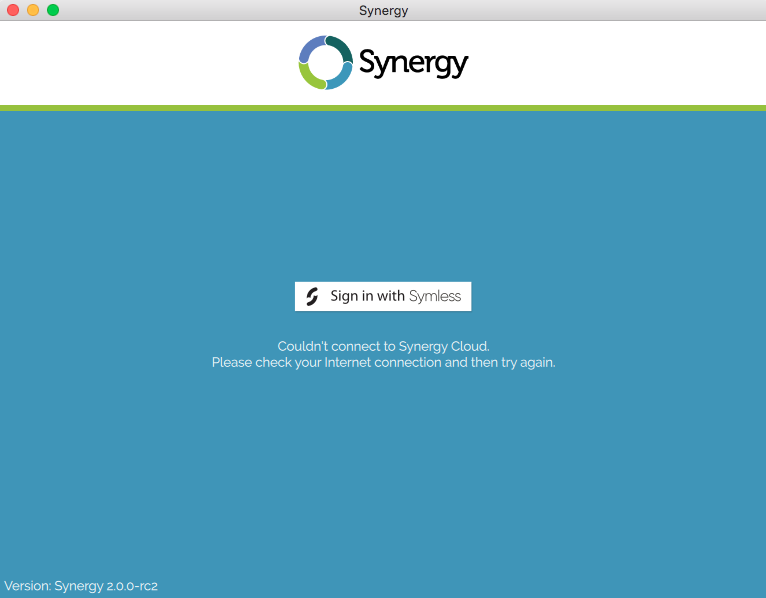 I'm getting Couldn't connect to Synergy Cloud as well. It would be great if there were local fallback, at least for LAN usage. Super inconvenient. What if I wanted to use it on an air gapped system with no Internet access? Just bougt Synergy 2 and installed in on 2 Win10 x64 machines, on both i'm getting a "504 Gateway Time-out" in my browser after being prompted to sign in the app. I just bought Synergy 2 but i get this "There was a problem to the background service" ? On one machine (which I've previously used with Synergy 1 and the Synergy 2 beta) I get "There was a problem connecting to the auto-config service. Retry". I hit Retry a couple of times with no response. I uninstalled and re-installed but got the same thing. However, after hitting Retry a couple of (more) times, it briefly acted like it was going to work. Unfortunately, after going back and forth a few times between working and the retry screen, it's now stuck on the retry screen again. BTW, I just noticed the message is slightly different. Now it says "There was a problem connecting to the background service. Retry". And now when I hit Retry the Synergy client went away and came back. It prompted me to "Sign in with Symless" but when I do it says "Couldn't connect to Synergy Cloud. Please check your Internet connection and then try again." That's an obviously wrong error message as I'm typing this reply on the Internet on the same system right now.